Danigral - 1 out of 5. I don’t understand what this is trying to do...perhaps make defending and taking casualties a more palatable proposition by replacing the character you lost? Perhaps comboing it with destruction/wounding effects to turn it into a cantrip? It just doesn’t seem worth the effort. mnBroncos - 2 out of 5. Arguably the worst of the attach to a story cards seen so far. However, possible card advantage is welcome but still isn’t great. Obtuse - 2 out of 5. Hard to trigger. You’ve got some cards like Y’Golonac in faction that can help with that, but you’re trying really hard at that point. I’m giving it a 2 for some possible synergy with the new upcoming Shub box? Never say that I’m not a benevolent card reviewer. livingend - 1 out of 5. I’m genuinely surprised Lit by Death-Fire isn’t a Condition, as that would’ve described the theme of the card quite adequately. Speaking of themes, this last part of the box seems deplorably slanted in the direction of atrociousness. Well, I guess that at least suffices as segue for another equally atrocious pun. Verdict: Don’t let your deck end up Littered by Death-Fire. WWDrakey & Ire - 2 out of 5. Eugh… so we essentially need 1) to fool your opponent into a situation where somebody gets destroyed at this very story, 2) for the Story to not get won while we’re at it, and even then we need to hit 3) at least one character in your top 3 cards. And after all that, it just goes to your hand. Eugh, competing for the spot of “worst story attachment in the box”, and the second point is simply for the synergy with Black Dog, and to leave room for shenanigans with the tech in the upcoming Shub-box. 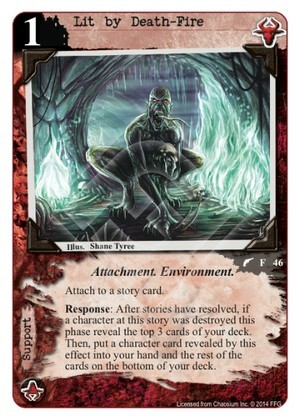 Did this card get any synergy after the Shub box? I don't see any..